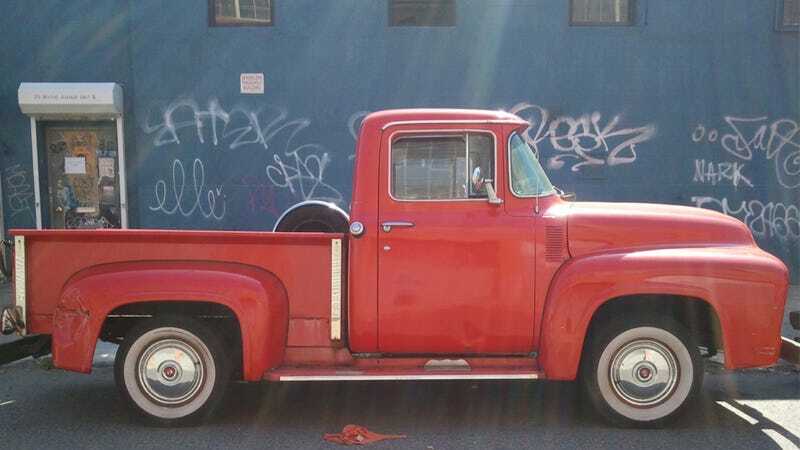 It's not often that you see pickup trucks just hanging around Brooklyn, especially if they're not somewhere between 10 and 20 years old and full of construction equipment. So seeing anything outside that range, especially in this condition, is a rare treat. Yes, I know the paint's bubbling, and yes, I know it's got dents, and yes, I know it's got rust, and yes, I know there's a Heinz 57/ketchup paint joke somewhere in here, but what kind of condition are most 57 year old people in? Especially when you consider ones with such an intricate tramp stamp so loving tatted on the back. This particular Ford F-100 pickup is distinguished as a 1956 model by its wraparound windscreen, which should still be a standard stylistic device on all cars and if you disagree you are wrong. It's also paired with the "Y-block" V8, which pumped out 173 horsepower. 173 horses was actually quite a bit in those days, especially if you consider that Ford's Flathead V8, available just three years earlier in this Ford truck's generation cycle, put out only 100 horses.